First place winner at The International Society for Applied Ethology, Denmark, 2017. American Dairy Science Association, Pittsburgh, 2017.
International Society for Applied Ethology, Aarhus, Denmark, 2017. 10th World Congress on Alternatives and Animal Use in the Life Sciences, Seattle, 2017.
International Society for Applied Ethology, Edinburgh, 2016. 9th World Congress on Alternatives and Animal Use in the Life Sciences (WC9), Prague, 2014. Effects of dry-off management on behaviour and milk leakage in dairy cattle. Annual Scientific Meeting of the Canadian Bovine Mastitis Research Network, Montréal, Canada, 2012. Cow comfort in dry lots: lameness, leg injuries and lying times on dairy farms in Texas and New Mexico. ADSA/CSAS/ASAS Joint Annual Meeting, Phoenix, USA, 2012. J. M. Huzzey, J. A. Fregonesi, M. A. G. von Keyserlingk, and D. M. Weary. Changes in feeding and social behavior when dietary experience does not match expectation: Effects of spatial and temporal variation in feed quality. Dairy Cattle Welfare Symposium, Guelph, ON, Canada, 2012. Online engagement on contentious issues in dairying: Should dairy cows have access to pasture? Web forums as a method for engagement on contentious issues in dairying: Should dairy calves be separated from the cow within the first few hours after birth? 30th Annual Western Canadian Dairy Seminar, Red Deer, Canada, 2012. Should we provide pain relief for disbudding and dehorning dairy calves? 51st Annual CALAS Symposium, Vancouver, Canada, 2012. 29th Annuam Western Canadian Dairy Seminar, Red Deer, Canada, 2011. ADSA/CSAS/ASAS Joint Annual Meeting, New Orleans, USA, 2011. 5th International Conference on the Assessment of Animal Welfare at Farm and Group Level, Guelph, Canada, 2011. Will “welfare bears” be forced into a life of crime and violence? The Wildlife Society Conference, Waikoloa, Hawaii, 2011. A new model for corporate driven animal welfare assessments: benchmarking cow comfort as a service for dairy farmers. 8th World Congress on Alternatives and Animal Use in the Life Sciences, Montreal, Canada, 2011. ADSA/CSAS/ASAS Joint Annual Meeting, Denver, USA, 2010. 10th ISAE North American Regional Meeting, Pullman, USA, 2010. 45th Annual Pacific Northwest Animal Nutrition Conference, Vancouver, Canada, 2010. Human Dimensions of Natural Resource Management Conference, Revelstoke, Canada, 2011. Federation of Laboratory Animal Science Associations (FELASA) Symposium, Helsinki, Finland, 2010. Universities Federation of Animal Welfare (UFAW) Symposium, York, UK, 2010. 31st International Ethological Conference, Rennes, France, 2009. ADSA/CSAS/ASAS Joint Annual Meeting, Montreal, Canada, 2009. 42nd Annual Convention of the American Association of Bovine Practitioners, Omaha, USA, 2009. 44th Annual Pacific Northwest Animal Nutrition Conference, Boise, USA, 2009. 27th Annual Western Canadian Dairy Seminar, Red Deer, Canada, 2009. 18th Biennial Conference on the Biology of Marine Mammals, Quebec City, Canada, 2009. 7th World Congress on Alternatives & Animal Use in the Life Sciences, Rome, Italy, 2009. Does enzymatically hydrolyzed yeast affect the feeding behavior and immune function in early lactation dairy cows? Can milk production or feeding behavior serve as an early indicator of mastitis? Temperature preferences and feed level of newborn dairy calf. 42nd International Congress of the ISAE, Dublin, Ireland, 2008. Sickness behaviour induced with low doses of lipopolysaccharides in dairy calves. 29th World Veterinary Congress, Vancouver, Canada, 2008. Does overnight access to pasture reduce lameness in dairy cows? Automated detection of lameness in dairy through measures of weight distribution. 26th Annual Western Canadian Dairy Seminar, Red Deer, Canada, 2008. Effect of overnight pasture on metritis and milk production of transition cows. ADSA/ASAS Joint Annual Meeting, Indianapolis, USA, 2008. Changes in feeding behaviour identify cows at risk for subclinical ketosis. A comparison of two commonly fed diets for hand-reared neonatal harbour seals (Phoca vitulina). Inhalant anaesthetics as an alternative to CO2 euthanasia. Changing patterns in the use of research animals vs. public attitudes: Potential conflict. The effect of dystocia on the feeding and standing behaviour of Holstein dairy cows. The effect of competition on the behavior of transition Holstein dairy cows. The effect of dystocia on the feeding and standing behavior of Holstein dairy cows. 43rd Annual Pacific Northwest Animal Nutrition Conference, Tacoma, USA, 2008. Optimal weaning strategies for high-milk-fed dairy calves. Feed bunk design and management. 25th Annual Western Canadian Dairy Seminar, Red Deer, Canada, 2007. Free stall design and management. Rats show aversion to argon over a range of flow rates. Losing ground on the 3Rs: A bibliometric analysis of changing patterns in animal use. 6th World Congress on Alternatives and Animal Use in the Life Sciences. Tokyo, Japan, 2007. Marine mammal marking techniques: a critical review of the effects. 17th Biennial Conference of the Society for Marine Mammalogy, Cape Town, South Africa, 2007. Effects of access to pasture before calving on hoof pathologies in dairy cattle after calving. 14th International Symposium on Lameness in Ruminants, Colonia del Sacramento, Uruguay, 2006. Effects of milk allowance and age on meal patterning of dairy calves. 40th International Congress of the ISAE, Bristol, UK, 2006. Effects of pain due to lameness on feeding and standing behaviour in dairy cattle: responses to ketoprofen. Case studies on the effect of sole ulcers on kinematic measures of dairy cow gait. Effects of pain due to lameness on cow gait: a dose-dependent response to ketoprofen. Effects of age and milk allowance on responses to abrupt weaning in dairy calves. ADSA/ASAS joint meeting, Minneapolis, USA, 2006. Changes in standing behaviour identify cows at risk for digital and interdigital dermatitis. Multiple uses of pigs: can they help to inform us about people’s attitudes towards animal use and genetic modification? GELS Workshop, Vancouver, Canada, 2006. Behavioural responses of dairy cows to dry off procedures. Hunger behaviour in dairy calves. 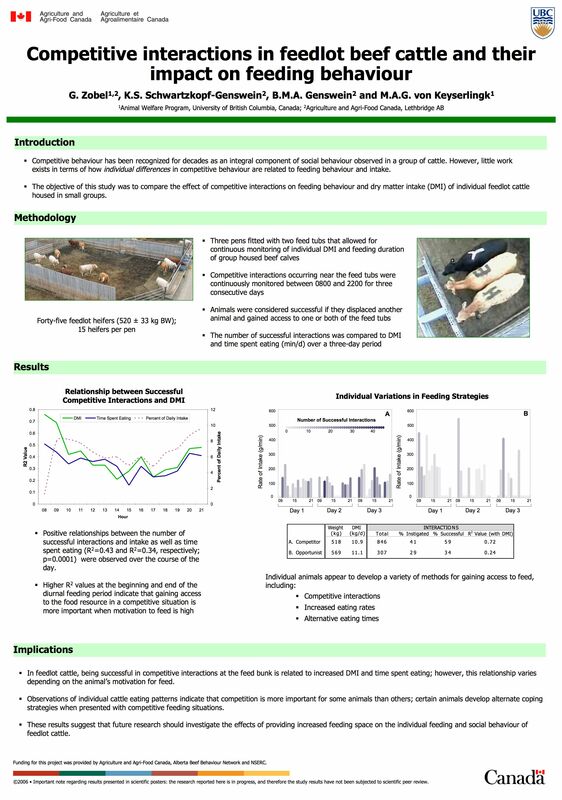 Competitive interactions in feedlot beef cattle and their impact on feeding behaviour. Beef feedlot cattle prefer more forage in their ration when given a choice. Effect of feeding frequency on the quality of TMR available throughout the day. 23rd Annual Western Canadian Dairy Seminar, Red Deer, Canada, 2005. Does carbon dioxide euthanasia cause distress in rats? 44th Annual CALAS Symposium, Vancouver, Canada, 2005. Drinking and competitive behaviour of dairy calves following introduction into a group pen. Improving the effectiveness of research ethics committees. 5th World Congress on Alternatives and Animal Use in the Life Sciences, Berlin, Germany, 2005. Heel erosion in dairy cattle. 22nd Annual Western Canadian Dairy Seminar, Red Deer, Canada, 2004. Higher stocking rates reduce feeding time. Effects of freestall maintenance on lying time. Hoof injuries and gait characteristics in dairy cattle. Higher stocking rates reduce lying time. Behavioural changes in dairy cows during the transition period. 39th Annual Pacific Northwest Animal Nutrition Conference, Seattle, USA, 2004. Detecting lameness in dairy cows. Rats show aversion to a gradually increasing concentration of carbon dioxide. 38th International Congress of the ISAE, Helsinki, Finland, 2004. Feeding behaviour identifies dairy cows at risk for metritis. Behavioural responses of dairy cows to dry-off procedures. Feeding behavior of dairy cows at peak lactation. ADSA/ASAS Annual Meeting, Phoenix, USA, 2003. Do your cows eat what you are feeding them? 21st Annual Western Canadian Dairy Seminar, Red Deer, Canada, 2003. Feeding waste milk to calves and antibiotic resistance. Stall surface affects hock lesions. Carbon dioxide euthanasia: mice and rats show different behavioural responses. 37th International Congress of the ISAE, Abano Therme, Italy, 2003.